Cool. That's the best word to describe Ireland's remarkable win in the Commodore's Cup a week ago. It was the coolest thing you ever saw, this stylish and clearcut team win, crafted in sailing conditions which were mostly hot and bothersome. And it has provided a mighty boost for a bruised sailing community which, two years ago, was simply unable to mount any defence whatsoever of our first ever Commodore's Cup win 2010. For, in 2012, the Emerald Isle was flat broke. Things are starting to move again, though ever so slowly. But when we look back on the crazy history of the boom and bust, it may well be that Irish sailors will realise that the upward turning point was this famous win. But in fact, the turning point must have been some little time ago, as it took months of visionary planning with quiet behind-the-scenes effort to put a realistic campaign together. Yet as the dust settles and the bubbles fade away, there's no doubt that one man is head and shoulders above all others in bringing this about. And he's here, the Main Man, the Irish Team Captain, in the soothing peace of his beloved home club of the Royal Cork at Crosshaven just four days after Ireland was declared winner on the lawns of the Royal Yacht Squadron castle at Cowes. Forty Irish sailors and their management broke into a mighty rendition of The Fields of Athenry. Noisy stuff and noisy celebrations which reverberated joyously back home. But here in the cool and calm of the friendly clubhouse, with a tasty bar lunch which, it later emerges, is on the house (thank you very much, RCYC), Anthony O'Leary is relaxing and taking a break. It's a short break not only from the demands of leading the Commodore's Cup campaign, but from the hectic pace of work, for back in the office he finds he's trying to do two months work in a week. That said, "taking a break" is only a relative term with an O'Leary. Planning, organisation, action and achievement are in the family's genes. Even in this hour-and-a-half of just shooting the breeze, more memories, concepts, ideas, suggestions and proposals are aired than you'd get from a waggonload of academics. And they're all pure gold, well weighted with wisdom. So who is Anthony O'Leary? Well, he's a Corkman through and through, a 58-year-old sportsman who has not been easy on himself down the years. He took a battering on the rugby field playing for Munster, yet at the same time he was building a formidable sailing career both in his own right and with his characterful father Archie, who got into the offshore racing game in 1971 when Anthony was 15 and already a rising star in Fireball racing at an age when many other youngsters would be still sailing Optimists. Naturally he shared the Crosshaven enthusiasm for National 18 racing under the tutelage of Somers Payne, but it was keelboat racing inshore and offshore which was to become his true metier. Serious success started in 1974, when the O'Learys raced their new production Carter 37 Irish Mist in the One Ton Worlds at Torquay. That was the year when Gumboots and Golden Apple grabbed the headlines, but Anthony recalls that one of his father's most treasured sailing prizes is the massive Production Boat Trophy. Irish Mist may have placed twelfth overall in a large and stellar fleet, but everything ahead of her was a mega-expensive one-off, yet she was in a class of her own at the front of the production boat division. They were hooked, and next boat up was the legendary Ron Holland-designed 40ft Two Tonner Irish Mist II, built beside Cork Harbour by George Bushe with his son Killian. Young Anthony was on the build team, and then went afloat with the new and fabulously successful boat to compete in, among other events, the Admirals Cup. It was a steep learning curve. For though Irish Mist II was among the best, not all the Irish team were front line boats. It was an early and lasting lesson in team assembly. Life in the 1980s became increasing dominated by a serious back injury in rugby which in 1988 saw complex surgery for spinal fusion, with three vertebrae being made into one. Not an experience for the faint-hearted, and he still shows evidence of it in his movement, though it doesn't cramp his style. Inevitably, active sailing was out for a year, but being Anthony O'Leary, he spent the entire season of 1989 making the only contribution he could, on the Royal Cork's Race Officer team. He recalls it as one of his peak learning years, and if he happens to make a comment about someone else's race administration, you know it is being done from a deep well of personal experience. Marriage came to Sally Aisher of one of the most renowned English sailing families, and their sons' subsequent sailing success at home and abroad is evidence of an extraordinary bloodline. Yet they could be an ordinary sailing family too – he fondly recalls pottering about Cork Harbour in a little clinker-built cruiser called Nerissima which he restored from a very tired state. However, the wheels of destiny were turning, and with the new Milennium in 2000, he became the youngest-ever Admiral of the Royal Cork, having served his time in many voluntary posts and on several committees during his climb aloft. He quips that the first thing any wannabe Admiral should know is that your members will expect you and your wife to be in the clubhouse greeting them every – but every – Saturday night, and you should be there most other nights too, as well as campaigning a boat of your own in true leadership style. It was a memorable two years, the highlight being Royal Cork's staging of the Laser Worlds, still one of the biggest and best dinghy championships ever sailed in Ireland. In typical style, O'Leary is diligent in listing off the top figures in Laser administration in Ireland and worldwide who ensured that it was such a success. As for his own sailing, we are now into the Antix years. 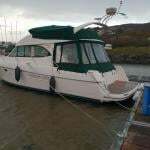 The first Antix was a Corby 35 originally called Converting Machine, and sailed home to Crosshaven one breezy November night from Plymouth in 23 hours with a doughty crew who were to become a key element in the O'Leary family's years of successful campaigning with a much-loved boat. Put simply, Antix was everywhere and won everything. But the inevitable change came with the 2008 Commodore's Cup when Colm Barrington turned up with a crisp new Croatian-built Ker 39 which, in due course, with a certain inevitability, became the new Antix, the boat with which Anthony O'Leary is now most totally associated. She may be six years old, but Antix is very much work in progess, and in his years of ownership – which got fully under way with the Commodore's Cup win in 2010 – O'Leary has been closely involved in the upgrades and modifications which have kept her at the front of the fleet. In 2010 she was a heavy weather superstar, but to broaden her range, they tried fitting a lighter keel bulb. That didn't quite work, so they went back to the original keel but tweaked the headsail sizes upwards. That resulted in three or four extra notches in the rating, but the boat is now nearly as good as she'll get, yet the work goes on. Antix racing in the Brewin Dolphin Commodore's Cup 2014. Although now six years old, with keen sailing, regular updates and fresh tuning she is still competitive, and in the series she secured three wins, two seconds and a third. With a boat of this calibre, and his own long-proven waterfront cred, Anthony O'Leary has been able to assemble an amateur crew panel of exceptional talent and compatibility. His system was working exceptionally well, so it was a cruel blow when any 2012 defence of the Commodore's Cup was declared a non-runner. But he saw the non-runner declaration as no more than unfinished business, and quietly asserted among friends that Ireland was on a four year defence programme of the Commodore's Cup dating back to 2010, and aiming for fruition in 2014. The hidden wheels were turning slowly, but turning nevertheless and with increasing purpose. It could be said that if you can't grasp how the entire complex panoply of a modern amateur offshore racing campaign is assembled without being told, then you're never going to catch on anyway. The essence of it all is keeping it low key. Quiet moves behind the scenes. Promising newcomers being marked down as possible future crewmembers. Subtle recruiting among top One Design sailors – you'd be surprised how comfortably they take to "truck racing". Gentle encouragement for those who merit it. Remember always the Holy Grail of compatibility, yet know when to accommodate the Awkward Squad when they have the talent. Steady building on a record of success. Simply having the boat ready and willing when you say you will. Having a realistic yet sufficiently demanding campaign in mind. A quiet sense of team building while cherishing individuality. It all adds up. That said, it has to be agreed that Ireland is uniquely placed to do well in today's top international amateur sailing events. The reality is that our population is too small and dispersed to support a significant professional sailing squad at home. Thus most of the crews sailing for Ireland in the 2014 Commodore's Cup team are of such a high ability that if their home was in the south of England, or a sailing area of France or the Netherlands, or around Long Island Sound or San Francisco or Sydney Harbour or wherever wealth and population and sailing coincide, then they'd be under great pressure to turn professional. After all, it's the easy option for busy owners with big boats to race. Simply paying someone who is good takes out a lot of hassle and cajoling and squaring of employers, which is the way things are done here. In Ireland, with the size we are and the way we are, we just don't do paid sailing. So when a major event with amateur emphasis like the Commodore's Cup comes along, we're in with more than a shout, even if it does involve yet more hassle and cajoling and squaring of employers to get some talented amateur sailor an extra day or two off work "to go yachting". But we like having the day job – it makes going sailing more fun. While keeping the kettle quietly on the boil at home in the recessionary years, Anthony O'Leary continued to play a leading role on the international scene. He rose to become Vice Commodore of the RORC, which gives him a special insight into the workings of what is, in effect, offshore racing's world body. Afloat, he was a regular and successful contender in major offshore race events. His sons meanwhile were cutting a hugely successful swathe through sailing at home and abroad. In all, it was a situation which had him ideally placed to assemble an outline of the personnel suitable for an Irish Commodore's Cup team in 2014. 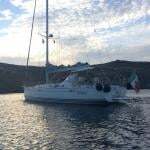 The Grand Soleil 43 Quokka, chartered by Michael Boyd and Niall Dowling of the Royal Irish YC, was an excellent all-rounder whose low rating for her size provided a very useful boost. Then there was the matter of boats. There was ruthless pursuit of the best possible. Antix was going better than ever. For a second boat, Niall Dowling, of Dun Laoghaire's Royal Irish Yacht Club, but with business interests in England and a sailing pied a terre in Cowes, had been disappointed by the lack of an Irish defence in 2012. So he teamed up with fellow RIYC member Michael Boyd and their search for a boat settled on a charter of the eminently suitable Grand Soleil 43 Quokka 8, a regular and very successful RORC contender in the ownership of Peter Rutter. The foundations were laid, but any prospect of success would be greatly aided by a new boat of exceptional potential. Thanks to his Olympic sailing son Peter's friendship with American sailor Geoff Ewenson, the younger O'Leary was on the inside track on a new Ker 40 being built for New York art dealer Mark Glimcher. The latest line of Ker 40s marks a considerable advance on Antix, as their flared hulls - which are dish-like at the stern – confer performance benefits which – when they're properly sailed – more than offset a higher rating. Antix managing to keep ahead of the newer Ker 40 Cutting Edge with her dished stern. As the winter racing season got under way in Florida early in 2014, Catapult was already cutting the mustard with the big regatta at Key West reinforcing her reputation, and providing Anthony O'Leary with the opportunity to go there and add the Glimcher boat to his team, as his son was in the crew. It boggles the mind, though, to imagine the scene. End of day's racing, everyone salt-stained and sunburnt, young Irish sailor goes up to owner and says: "Mark, this is my dad, he wants you to bring your boat to Europe to race for Ireland in the Commodore's Cup, and he'll organise most of your crew....."
Quite. Whatever technique they employed, it worked. But even so, when life is being lived at the New York pace, you reckon that anything that seems to good to be true usually is. So Anthony now admits that he didn't really believe it was all happening until the fantastic Catapult was unloaded from a ship in Europe. But by that time, his nascent team were having other problems. Quokka was doing the winter season racing in the Caribbean, and Michael Boyd and Niall Dowling had sailed aboard in the Caribbean 600. But then the ship which was due to bring her home in time for the RORC IRC Championships early in the new European season was badly delayed. However, the two Irish co-skippers gallantly chartered another temporary boat to get their crew training under way. Meanwhile Anthony O'Leary kept things nicely up to speed with a runaway overall win with Antix in the British IRC Championship. The closest challenge to Ireland came from the French teams. Among their boats was former Round Ireland winner Inis Mor, a sister ship of Antix. The Quokka crew had to charter another stop-gap boat to keep the show on the road. But finally their ship came home, and most appropriately it was Volvo Cork Week from July 6th to 12th when the Irish Commodores Cup Team 2014 of Antix, Catapult and Quokka finally made their proper debut together, and their performance was, to say the least, very encouraging. Fred Cudmore, Rosscoe Deasy, Jamie Donegan, David Lenz (UK), Ross McDonald, Derek Moynan, Darragh O'Connor, Robert O'Leary, Anthony O'Leary, Clive O'Shea. David Bolton, Grady Byus (US), Alan Curran, Garth Dennis (US), Geoffrey Ewenson (US), Mark Glimcher (US), Tom Murphy, Dan O'Grady, Peter O'Leary, Ian Travers. James Allan (UK), James Bendon, Michael Boyd, Laura Collister (UK), Ben Daly (UK), Niall Dowling; Jarrod Hulett (UK), Tom Whitburn (UK), Nelson Moore, Maurice O'Connell, Nicholas O'Leary. France's new A13 Teasing Machine had all the bells and whistles including twin rudders and a full factory shore support team, but Ireland's amateurs stayed ahead of her. They had the ships, they had the men (and one woman), but where was the wind? A great blocking high sat over England, and even the usually reliable afternoon seabreezes of the Solent were unable to generate. Yet astonishingly, despite the fact that Irish sailors are supposed to prefer a good breeze of wind, they did it, and in very convincing style in races of all shapes and sizes, and in a fleet of 27 boats in which several teams were built on almost unlimited resources. There was too much of this sort of thing – frustrating conditions for Quokka, Eleuthera and Localletterbox Zero II on the day when no race was completed. Localletterbox was originally Mariners Cove from Ireland. Ireland had the lead on points after the first day, and despite the occasional wobble, generally they showed a consistency which other teams lacked. It was a textbook exhibition of steady consistency, just one day at a time, and don't let the growing pressure get to you in a championship in which one entire day of racing was lost due to calm, yet the boats and crews had to spend a frustrating nine hours out in the race area achieving nothing. In due course, the series will be given minute analysis, but for now with the holiday weekend upon us, it's something to celebrate, and the Royal Cork YC has already begun the process with a rapturous welcome home party for the trophy on Thursday evening. As for Anthony O'Leary, when asked if he found any particular moment of the week of racing a difficult time, he admits that on the Thursday night, when it became clear the race management were determined to have a race round the Isle of Wight next day despite the fact that Ireland's met consultant Mike Broughton and many other metmen were certain there'd be almost total calm along the island's southeast shore with the race becoming a lottery, he was much troubled. "At the worst moments" he says, "I could see us being remembered only as the guys who blew a mighty points lead in the 2014 Commodore's Cup." 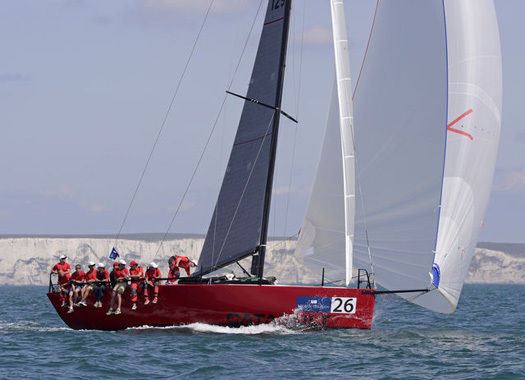 The steady performer – Quokka sailing better than her rating along the Isle of Wight's southwestern shore during the race round the island. that there'd be quite a decent breeze west of the Solent in Christchurch Bay, "yet here they were sending us off around an island with a great big 23 mile gap between places where they could effectively shorten the course". When I suggested that they might have been able to stop it at the island's south point of St Catherine's, he responded that experience showed that using anything other than a navigation buoy or a floating race mark to shorten a course almost always results in a protest on some grounds. "After all," he said, "it would be like trying to shorten the Round Ireland race by anchoring a Committee Boat off Rathlin Island". It has to be confessed we both had an unseemly fit of giggles at the very idea of a committee boat hanging on its anchor off Rathlin Island. But that was by way of relieving the remembered tension, for Antix had a bad time down at St Catherine's. Against the foul tide, trying to maintain a very good position she'd built up during the early stages of the race from Cowes, she biffed some rocks, as too did Catapult. When troubles come, they come not single spies but in battalions.....Antix arrives in fine form and well placed at St Catherine's, only to find a calm and then hit a rock. It was a very bad moment indeed, yet they hung in still racing, and when the finish was made for a shortened course off Bembridge, Ireland had lost only a few points in her overall lead, she was still well clear. But the troubles were only beginning. A quick liftout showed that Catapult was relatively unscathed. But Antix had serious keel damage, and worse still, a split in the rudder. With the final double-scoring inshore race coming up in the morning, it was a race against time by James Hynes and the Antix shore team to put right the damage, but after a ten hour session of seriously hard labour through the night, the job was done, and the Irish trio were in fine fettle at the start next morning. The series concluded with a result from heaven. Ireland didn't merely maintain her already satisfactory points lead over the two French teams next in line. Our team did a horizon job. In an initially good Solent sailing day but with a shortened course as the breeze faded, it was Antix first, Quokka second and Catapult fourth, but with line honours as compensation. It put them 174 points clear. The numbers say it all, for words are inadequate. The ICRA support team of Barry Rose, Fintan Cairns and Nobby Reilly were besides themselves with excitement, but since then they've calmed down and useful conclusions are being drawn from what they rightly describe as "this magic trip for Irish sailing". For Barry Rose, the abiding memory is of the maturity and sense of focus of the young Irish sailors, and the remarkable compatibility of the three crews. As for ICRA Commodore Nobby Reilly of Howth, he was impressed by the way that "Anthony and Barry just opened that box of experience, with everyone benefiting. With light and shifting breezes and strong tides, on each boat everyone from front to back was totally involved. This was no easy ride – one mistake and you were bin material". Fintan Cairns of Dun Laoghaire, who co-founded ICRA with the late Jim Donegan back in 2002, felt there were useful messages to be learnt which might be applied in a larger context. "Keep the management team small in numbers, keep it personal. It's a national success for sure, but we should be wary of anyone trying to "nationalise" it. This was achieved through a sort of sporting private enterprise. Everyone worked very hard indeed. They melded into a marvellous team, and it was an approach which worked very effectively". All, of course were lavish in their praise for the Team Captain, whose belief in the do-ability of the project, and his own gallant approach afloat, had brought it all to such a successful conclusion. The O'Leary Commodore's Cup success is the perfect illustration of the old saying that if you want anything done, then ask a busy man to do it. "So what's next on the agenda?" was the inevitable question asked of Anthony O'Leary as he relaxed in the Royal Cork YC on Wednesday. "D'you know what" he said, "I haven't a clue. Other than the immediate demands of our business, there's not really a thought in my head. But I've no doubt that some fine morning soon I'll waken up and there'll be an idea about sailing fresh and ready for consideration. And who knows, but it might just be worthy of implementation further down the line". So we trod delicately around the question of what might happen next with the Commodore's Cup. He happily admitted that he hugely enjoys racing in the Solent, but said that an interesting idea he'd heard was that the Commodore Cup's staging should be rotated between England, France and Ireland. Very diplomatically, he said he'd be particularly interested in racing in it if it was sailed at La Trinite on France's Biscay Coast. Unsaid from this, but logically following on, is that if the Irish are prepared to go to France, then surely the French and other national teams should be prepared to come to Ireland? It's the great imponderable, and Anthony O'Leary was happy to leave it hanging in the air. But for now (and this is my personal view), the fact is that Cowes is a sort of Brasilia or Canberra of European sailing, a neutral capital where few people are based, so everyone has to travel to get there. And while the sailing can be exasperating, when it's good it is utterly brilliant. Then too, we all have to note that the RORC has now entered into partnership with the Royal Corinthian YC in Cowes with its clubhouse near the waterfront. Inevitably, although the RORC has always been associated with some events far from the English Channel in times past, and with a headquarters in London, this new Cowes focus is inescapable, and it will be seen in operation again in eight days time when the RORC Round Britain and Ireland Race gets under way, starting and finishing in Cowes and all crews reporting back to race headquarters there. As for the Irish cruiser-racing scene, Anthony O'Leary is quite clear in his own mind as to how it should go forward. "I think it's a mistake to incorporate the ICRA Nationals in the Sovereigns Cup in Kinsale, as they're going to do next year" says O'Leary. "The Sovereigns is one of my favourite regattas, but it's a friendly intimate business. While the town may have the infrastructure ashore, the marina is always crowded and I don't see how the kind of fleet they hope to attract will be comfortably accommodated there." "Then too" he continued, "we already have two major alternating biennial regatta weeks, in Dun Laoghaire and Cork Harbour. It's time to accept that sailing people are seeking to focus on fewer major events, and to give a more compact annual programme their best shot. So let's see how it would work if the ICRA Nationals simply rotated between Volvo Cork Week and the Volvo Dun Laoghaire Regatta." You might well say this is dynamite, but in the early afternoon peace of the Royal Cork YC, it seemed reasonable enough. It certainly provided enough to think about while driving home along that marvellous highway which the National Roads Authority have obligingly installed the whole way from Carrigaline to Fingal. But cruise control along the motorway began to look like snooze un-control, so we headed across country for a reviving cup of tea by way of Durrow and Abbeyleix. Durrow was astonishing - the Durrow Scarecrow Festival and All Ireland Scarecrow Championship is in full swing, so give it a look if you're heading southwest over the holiday weekend, it's on until Monday evening when the winner will be declared. But Abbeyleix was somnolent as only a little Irish town far from the sea can be in the dense heat of late July. No movement at all, except for two plump and jolly men unloading a consignment of shiny new coffins. Very shiny new coffins. You can forget about your fancy modern bio-degradable basketwork coffins for the dear departed of Abbeyleix. When they're planted, they stay planted. And as for how the ICRA Nationals should shape up in future, well, you heard what the man said.